All claims adjustors know the routine. A client files a claim—let’s say he’s a homeowner with a roof hit by a hailstorm—and they survey the damage. Standing outside his property, he insists the event affected him so much that all of his shingles need replacing, while the adjustor, after taking time to climb up the roof, judges the destruction as less widespread. In the end, a compromise emerges that probably dissatisfies both parties. A more exact and equitable approach would make for a better customer experience (and result in more accurate data for the insurer). Now it can be, thanks to aerial intelligence. Aerial intelligence uses drones and associated software to survey sites more effectively, efficiently, and safely than traditional practices. Automated and simple to use, it provides insurers with the precise analytics they need to make informed decisions. Operations—A sophisticated aerial intelligence platform integrates legacy systems and processes, allowing teams to do more in less time. By avoiding the tedium of setting up ladders and other equipment to get to hard-to-reach areas in favor of deploying drones, the survey process takes less time. In early tests, we’ve found that users complete a single survey in 15 minutes. That enables the processing of more claims per day. Precision—Guesstimating the location and extent of damage on properties and buildings wastes time and money. With aerial intelligence, video recorded by drones shows exactly where and what kind of destruction took place. This way, insurers can see what happened before determining remuneration. Also, they can use the data to insurers hone their forecasts, optimizing risk management. A well-designed aerial intelligence program helps insurers reach short- and long-term goals by providing more than just drones themselves. It goes beyond that by integrating with existing systems and processes, enabling claims professionals to become certified in drone operations, and ultimately providing leaders with actionable intelligence. 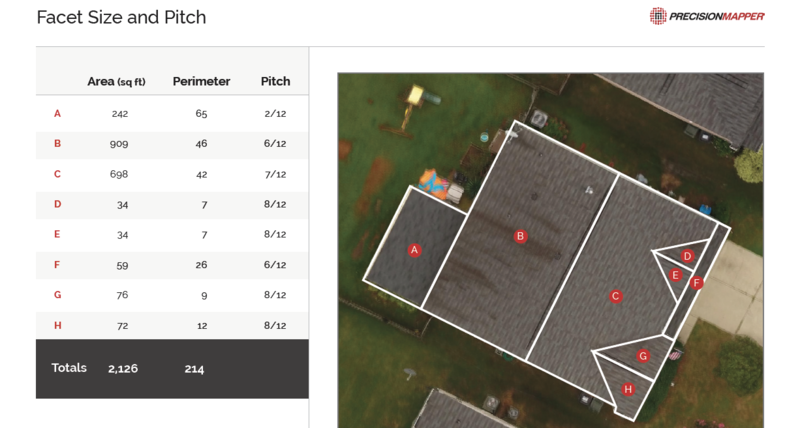 For insurers who’d like to add drones to their toolset, but don’t need customized development, systems integration or flight support, PrecisionHawk now offers the Smarter Insurance Package with Roof and Hail Report Algorithms. The package includes a drone, PrecisionHawk’s suite of advanced sensors, plus integrated flight and data analytics software. Available as a monthly subscription, insurers will get the latest hardware and software as they become available. First, the claims professional flies a drone and captures rooftop imagery. Then, they upload the images to PrecisionMapper, our cloud-based mapping and analytics software. For hail damage, the user annotates the areas where hail damage has occured. Compared to traditional surveying methods, insurers using the Roof Report save time, reduce risk and eliminate inconsistencies. The algorithms will be available alongside PrecisionHawk’s growing library of turnkey analysis tools in the PrecisionMapper AlgoMarket. To learn more about the package, algorithms, and how to add aerial intelligence to insurance programs, visit our Smarter Insurance page. Or speak with a PrecisionHawk expert today.